To be truly functional, your kitchen cabinets need to do more than just hold items. They need to help you organize and utilize them as well. Utilizing the various options available as cabinet pull-outs can help you make the most out of your kitchen. If you're having new cabinets put in your kitchen, consider utilizing the space below your cabinets with some toe kick storage. The toe kick is the area just below the cabinets, set back slightly to give some room for your toes. Omega Cabinetry: Omega offers both custom and semi-custom cabinets that you can have built to include toe-kick storage and other built-in pull outs. By mixing custom and semi-custom parts, you can often get a better price on your cabinets. Fieldstone Cabinetry: Fieldstone also offers both custom and semi-custom cabinets. They have several options for pull outs, including toe kick storage. You can also mix custom and semi-custom together with this line, getting a custom look at semi-custom prices. 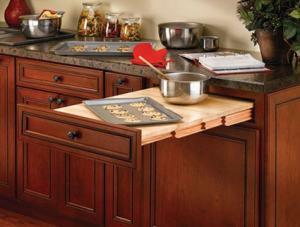 Plain & Fancy Cabinetry: Plain & Fancy Cabinetry builds handmade cabinets specific to each room. They can create custom options like toe-kick storage as well. 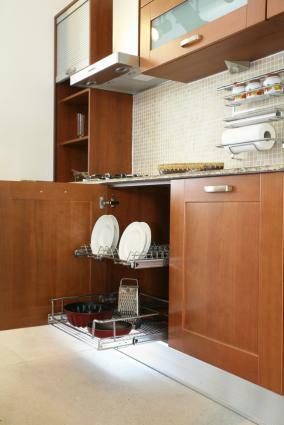 By having the cabinets built to your kitchen, you can vary the sizes of the drawers. A pop-up shelf is a great option if you use a lot of heavy appliances like mixers or espresso makers on a regular basis, but you don't want to give up valuable counter space to them. A pop-up shelf installs inside the cabinet below the counter. You set your appliance on the shelf, and when you want to use it, you pull the shelf toward you. As it comes out, it also unfolds to move upward until the shelf is level with the counter. No need to lift the appliance in and out, or store it on your counter. Rev-a-Shelf Heavy Duty Mixer Lift: A chrome pop-up option that mounts to most cabinets, this is a very smooth-moving mechanism that lets you customize the size and style of your shelf. 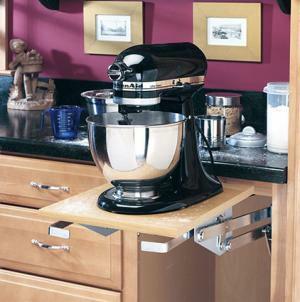 It lifts right up to counter height, so it's easy to use your appliance once it gets there. It retails for about $80. Rockler Under Drawer Swing Up Appliance Mechanism: This option mounts below drawers in your kitchen to bring appliances up to 20 pounds to a working height. This gives you more mounting options than other models, so you can find just the right spot in your kitchen. It also releases on a trigger, so anyone can use it. It retails for about $82, and does not include a shelf. Auton Appliance Lift: If you want a truly space-age kitchen, consider having a motorized appliance lift from Auton that will pop out your appliances from beneath the counter at the touch of a button. This is perfect for people that don't want to - or can't - bend down to release the mechanism. Prices on request. Rev-a-Shelf Wood Pull Out Tambour Table: A heavy duty and attractive wooden option that uses your drawer front with its own slides to extend, retract and lock in place. This option also allows you to mount it to a door for extra space saving. It retails for about $260. EZ Slide N Store Wood Breadboards: This inexpensive option mounts inside your cabinet; open up the cabinet doors to slide out the board. This type of pull-out cutting board is a great space saver for smaller cabinets. It retails for about $50. Accuride 340: If you want to mount your own cutting board, consider using the Accuride 340 drawer slides. They can hold up to 100 pounds, which makes them a great option for heavy butcher block cutting boards combined with large roasts or turkeys to carve. They will accept your drawer front if you want to retro fit and retail for about $57. 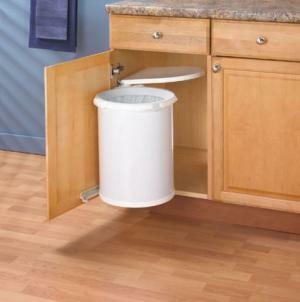 Rev-a-Shelf Double Bottom Mount Aluminum Waste Containers: This slide-out option fits two standard kitchen-sized waste baskets in its hardware, with the door attached to the front. The entire unit pulls straight out, making it a good space saver for tight corners where door swing is an issue. It retails starting at $370. Rev-A-Shelf Stainless Steel Sink Base Pull-Out Double Bin Waste Containers: This slide-out option can be retro-fitted into any sink base cabinet. It holds two sizes of waste containers, which is perfect for people who like to separate their garbage; put the recycling in one container and your trash in the other. It retails starting at $254. Hafele Quart Side Panel Mount Pivot-Out Waste Bin: This unobtrusive pull-out option mounts on the wall of your cabinet, then rotates in and out as you need it. If you don't have enough space to dedicate an entire cabinet to your trash can, but still want it tucked away, this is a good option. It retails for about $87. If you need a way to organize things inside your cabinets, some pull-out organizers may help. There is a wide variety of different organizers on the market today, all of which can be retro-fitted inside any cabinet. Choose from sliding drawers to hold smaller items, sliding spice racks that fit inside drawers, wire baskets to hold things like aluminum foil and slotted shelves that can hold cookie sheets. ClosetMaid 2-Tier Cabinet Organizer: If you don't want to permanently mount something insider your cabinet, the ClosetMaid 2-Tier Cabinet Organizer is a good choice. It sits inside any cabinet, and has two sliding baskets to hold pans, canned goods or boxes. It retails for about $46. Slanted Side Pull-Out Shelf: If you want a few sliding pull-out shelves in your kitchen, consider the Slanted Side Pull-Out Shelf, which gets shallower toward the front. This lets you organize goods by height for easy access. It retails starting around $60. 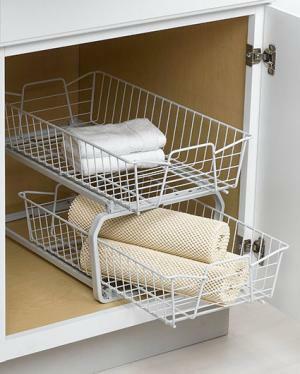 Rev-A-Shelf 2-Tier Metal Pull Out Cabinet Basket: This cabinet basket is designed to help you organize your pots, pans and lids. Each of the two tiers operates independently, and there's room on the racks for up to 12 pans. Perfect for uncluttering any cabinet. It retails for around $125. By utilizing pull-out options for your kitchen cabinets, you can open up more counter and cabinet space than you ever knew you had. Get organized with a few of these pull-out options for your kitchen and see how much space you can create.